Are you always beating your coworker at solitare? Now you can really rub it in. By hitting the “Print Screen” key, a “photo” is taken of your current desktop picture and the click.to menu pops up above your cursor. Now just click click.to Outlook and your winning photo is already added to an e-mail. Address it to all of your colleagues and hit send. Let the office war begin! Want to know how you can guarantee that you’ll never forget to add an attachment to an e-mail before you send it? You can make it easier on yourself by starting your e-mail with the attachment. 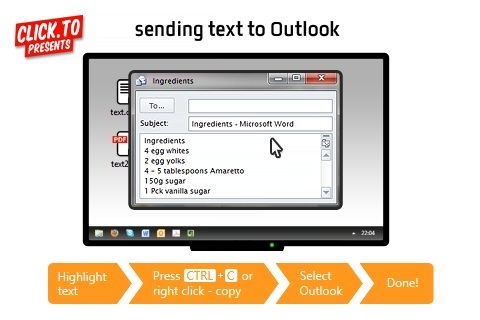 Simply highlight the file, Ctrl+C or right click -> copy and click.to Outlook. Whether it’s a PDF, document, image or music – it’s added as an attachment into an e-mail that you can add the text and recipient address to and send. Have you finally found a factual text that explains precisely and easily how to use the new machines? 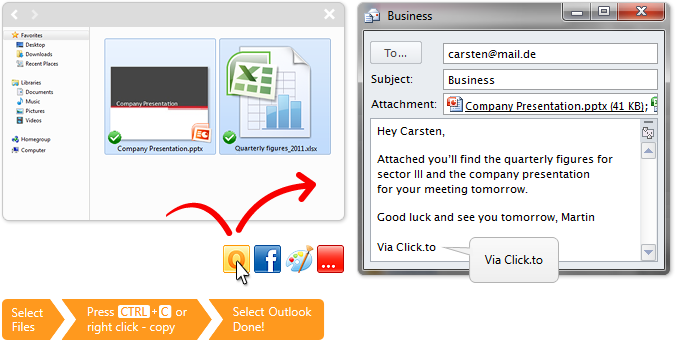 With click.to you can share it with your co-workers with just one click: just highlight, Ctrl+C and click.to Outlook! Click.to adds the text to an e-mail – all you have to do is send it!